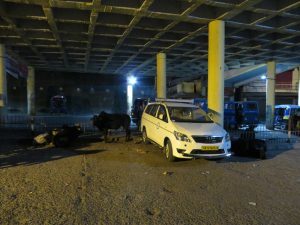 We arrived in Rishikesh late at night and very hungry. Our guesthouse had a policy of locking the shutters on the front doors at 9:30pm, but it was after that time when we arrived, and we hadn’t eaten. The dedicated staff member who sleeps on a folding bed in the lobby dutifully waited up while we ventured out in search of food. Beside our guesthouse was a car park (or, as we referred to it, the cow park), which was a hub of activity day and night. It was a gathering place for rickshaw drivers to drink chai, play cards, and gossip. We didn’t need to get a rickshaw, however, because there was a good restaurant just across the cow park. Full of good food and completely exhausted, we fell into bed and shivered until we warmed the quilts and mattresses with our body heat. Rishikesh in January is COLD! The next day, we were able to appreciate the location of our guesthouse more fully. It was right on the banks on the Ganga (Ganges River), often referred to as “Ganga Ma” (Mother Ganges). It this altitude, the river is still relatively clean. “Relative” is a relative term, of course – those gravel flats in the distance are where the corpses get burned, and the remains are then dropped into the river. 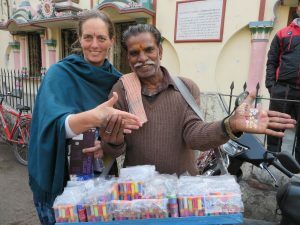 Our friend Usha, a Swiss national who has been married to an Indian baba for many decades, manages the guesthouse as part of her karma yoga. She says there are even unburned corpses floating downstream from time to to time. So, relatively clean. Cleaner than it is in Varanasi, the famous funeral city, anyway. At least in Rishikesh, it doesn’t smell like a sewer! We broke out every piece of warm clothing we owned, to try to survive the chill. This colourful hoodie was one of Ravi’s favourite purchases from Goa. It was still ridiculously cold, especially in our room at night. The temperature got down to single digits Centigrade overnight, and the buildings were not in any way insulated. This is somewhat understandable, given that the average top temperature in May is 39 degrees C, and buildings also need to be designed for ventilation cooling. Ravi found the briskness enlivening, but Jenny found herself curling into a smaller and smaller ball to try to keep warm. After a much-needed hot breakfast, we set out to explore Rishikesh. 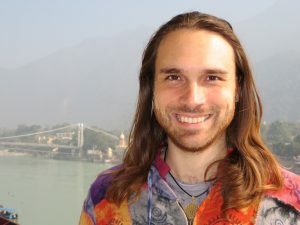 Despite being famous internationally as the place where the Beatles studied with their guru, Rishikesh was a tiny backwater on the tourist map until quite recently. It has always been a place of pilgrimage for Indian nationals, partly because it is a place to access the Ganga, and partly because of the nearby temple marking the spot where Shiva swallowed the poison and saved the world. 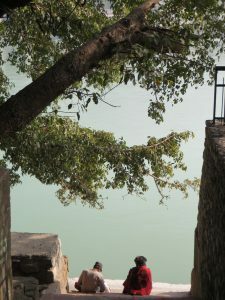 Despite the almost-freezing temperatures, there would be families coming down to the gat (public bathing steps) from dawn each morning to swim in the Ganga. Apparently, bathing in the Ganga just once washes away all your karma and allows you to escape the cycle of death and rebirth. Back in the 1980s, Rishikesh was two bridges, a large ashram, and a bunch of forest babas meditating under trees. At least, this area was – there was a township a couple of kilometres downstream. These days, everything is geared for tourists. 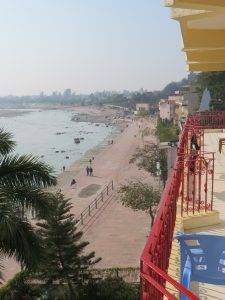 Every piece of flat ground (and even the occasional cliff face) is concreted, built up, and populated by guesthouses, restaurants, souvenir stands, and chai wallahs. 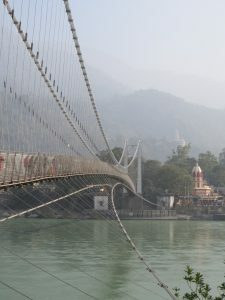 We walked along the river bank from our guesthouse to the nearer of the two bridges, Ram Jhula. 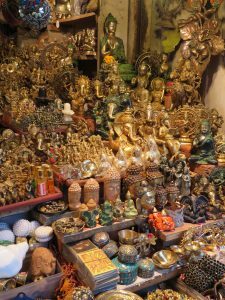 We were funneled through a double row of market stalls selling everything from clothing to shivalingams. The bridges are suspension style, with asphalt. Technically, they are pedestrian bridges, but in practice, people ride motocycles across them all the time. They are narrow, dotted with beggars and kids selling fish food, and regularly blocked by people posing for photos or feeding the fish. Adding motorcycles to the mix simply ups the confusion and frustration levels! 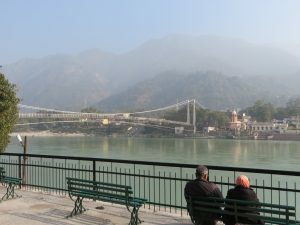 In general, people are quite good-humoured about the slow shuffle to get across the bridges, and the views of the Ganga are quite spectacular. 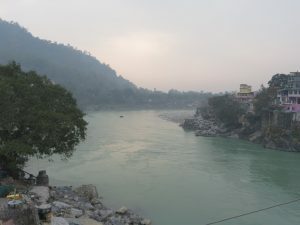 We were planning to attend satsangs with Prem Baba at an ashram near the other bridge, Laxman Jhula (yes, “jhula” means “bridge”), so our ultimate goal was to reach Laxman Jhula, a kilometre or so upstream. However, you can’t be in a hurry in Rishikesh. The bridges, being narrow and suspended, have a distinctive bounce to them. It can be quite disconcerting if you accidentally start walking at the correct resonant frequency! The locals were all well rugged-up with shawls and beanies, and we reluctantly acknowledged that our tropical wardrobes were not really up to the task. We would need to buy cold weather clothing, even though we were only going to use it for a couple of weeks. This chap is a chotiwala. 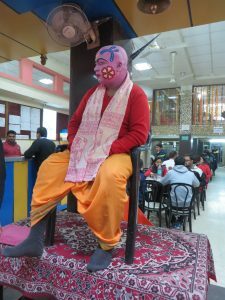 His job is to sit outside the famous Chotiwala restaurant and be the chotiwala. “Wala” smply means “seller”, so a chai wala sells chai, and a roti wala sells roti. A “choti” is the traditional lock of hair worn by orthodox Hindu men. This one is spectacularly epoxied into a punk mohawk version of the modest traditional do. People stop by to take their photos with the chotiwala, which gives the servers/wranglers a change to swarm out and thrust menus at them. They are very encouraging about coming in to try the food. We never did. Friends of ours who visit regularly had voiced concerns about the food hygiene, at least in one half of the restaurant. The restaurant is divided down the middle, and the two halves are in somewhat antagonistic competition. Farther up the hill, we found the fruit walas engaged in their daily detente with the omnipresent hungry skinny cows. Notice that even though it is getting close to mid-day, everyone is wearing parkas and beanies. Have we mentioned that it was cold? We were cold, unless we were walking briskly. A bindi wala insisted on giving Jenny a sample of his oil-and-powder stamp art. We gave in and bought a couple of sets. How can you say “no” to a smile like that? And then we got to say “have already” to all the others (of which there were MANY!). 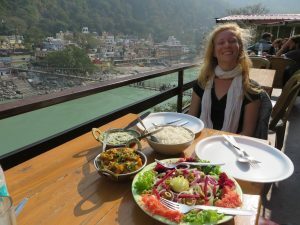 Finally, we made it to Laxman Jhula, located the ashram, and found a good place to have lunch overlooking the river. We also ran into some friends of ours from the Agama yoga school in Thailand. 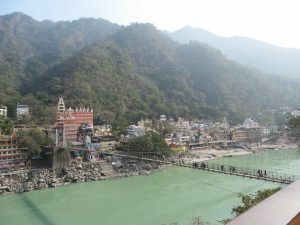 This is not as bizarre as it might at first sound, because there is an Agama branch in Rishikesh, which has been established for a long time. Swami used to teach there, until the ever-escalating bribes required to stay in business became prohibitive, and he relocated to Thailand. 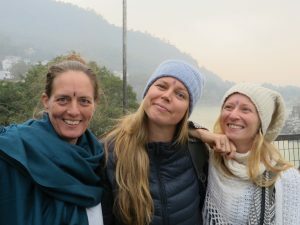 The Rishikesh branch is now only open when the Indian teacher, Muktananada, can be there. Yoga schools run by Indian teachers don’t attract the same level of extortion, so he can operate it profitably. We watched in fascination the troop of monkeys who live on the Laxman Jhula bridge. The game seems to be to spot someone crossing the bridge with food in their hands, or in a bag that is grabbable, and then to try to startle them into dropping the food. If they can’t be guilted or cuted into giving it freely, of course. 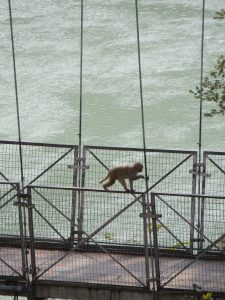 There are two main types of monkeys in Rishikesh – the large, light grey ones, and the smaller, reddish-brown macaques. The macaques are much more aggressive with humans, as we would discover. After lunch, we all walked across Laxman Jhula together, pausing to admire the view and take some photos. We parted ways with Katka and Deniz on the other side of the river. We were searching for the place that Deniz bought her hat, so that we could be properly rugged up before the temperature plummeted again in the mid-afternoon. They had other shopping to do, but we would all be together the next morning at Prem Baba’s satsang. Our mission was successful, and we became the proud owners of gloves, beanies, and multiple pairs of woollen socks. There is definitely something special about this place. The river is an odd shade of light green, possibly because it is full of glacial sediment, and it winds between cliffs and sandbanks, suggesting some kind of inscrutable mystery. 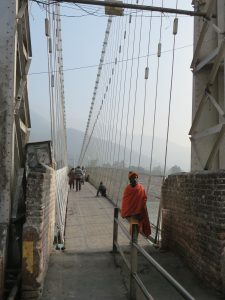 Despite the bone-creaking cold, we look forward to the next few weeks of discovering Rishikesh! 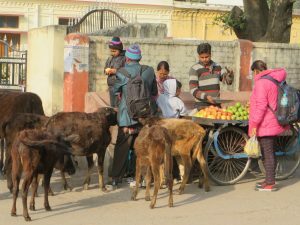 ← India: Day 835-838 (Jan 12- 15, 2016): Back to India!